Acrodyne are proud to announce that YTC have recently released the YT-3300 series Electro Pneumatic Intrinsically Safe Positioner certified IECex . As with previous models, the YT-3300 features an easy to see LCD display offering a range of information and offers a visual rotating beacon which can be viewed from most angles. The unit offers an auto calibration function which makes commissioning fast and simple.The operating menus are clear and concise offering full diagnostics which assists in field troubleshooting. The unit also comprises an Auto/Manual switch which quickly and conveniently provides supply air directly to the actuator for complete and partial stroking of the valve. A wide range of options are available, such as HART digitally enhanced 4-20 mA smart instrument communication. Other options include 4-20mA transmitter and limit switches. PID and Alarm functions are standard. 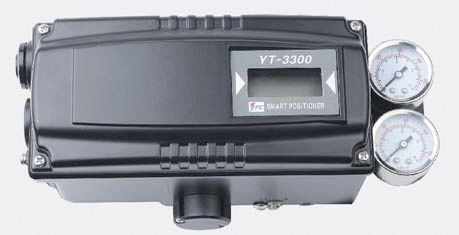 The YT-3300 comes in either Linear or Rotaty which is NAMUR compliant. The housing is aluminium diecast to an IP66 weatherproof rating. Acrodyne offers a wide range of mounting kits to suit most actuators and offer the services of commissioning and repairs to all YTC products.